I was adopted today to be the friend for a sweet bunny named Lop! 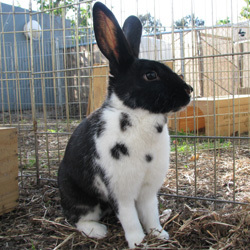 I am a gentle and calm bunny with very unusual markings. My head and bottom half are black, but my chest is white with black spots. I am charming and beautiful - why not come meet me today?